Is there something slightly devilish about making a great batch of sugary-sweet treats, for the sole purpose of bestowing upon others as “gifts”? Do you get that Grinch-like smirk, stirring a bowl of melting chocolate and butter, thinking, this is not all going in my belly, ‘cept for one teeny bite? And then, does it dissolve just as quickly as those last slicks of butterfat when your first “sneak” lick from the spatula turns into two, then three, then five? Concluding with a sigh, that we’re all in it together. ‘Tis the season for overeating. Yours, mine and their ultra-rich holiday foods. I’ve worked myself into such a food-making frenzy over the past couple weeks that I haven’t had the stamina to blog. Holiday dinner after holiday dinner, potluck after cookie swap. You know the drill. But if there was a week to treat your friends and co-workers to a small token of your cookery, it’s this one, leading up to Christmas. These treats have a couple distinctions from the dinner party set: they’ve got to be easily portable, and the longer they can last before you eat them, the better. I’ve been blessed with delicious samplings from other home kitchens, like shortbread and double-fudge brownies. So I’m in the spirit to spread the good tidings. 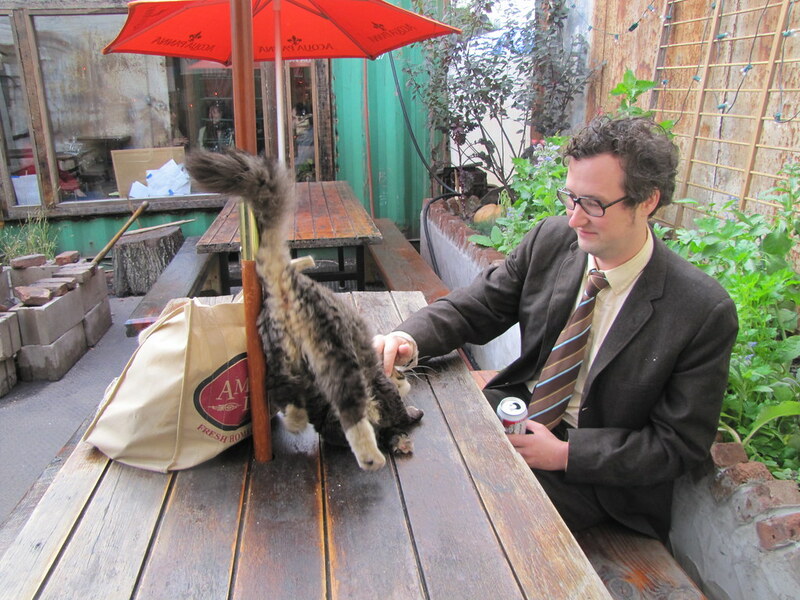 This year, I’ve decided that my “office” can be Roberta’s Pizza, where Heritage Radio Network is based, and where I spend an afternoon every Monday before and after hosting Let’s Eat In. The crew at Roberta’s roof garden and waitstaff are always good company, and the folks who host shows after me, like the guys from Snacky Tunes and Nicole from Hot Grease, always show up in due time. Then there’s the guests I bring on air each week, who are always friends to some extent. I don’t have too many staples in my schedule these days, so Mondays have become really grounding. There’s even a Christmas tree outside the station, to add to the homey charm. So I brought in truffles today. 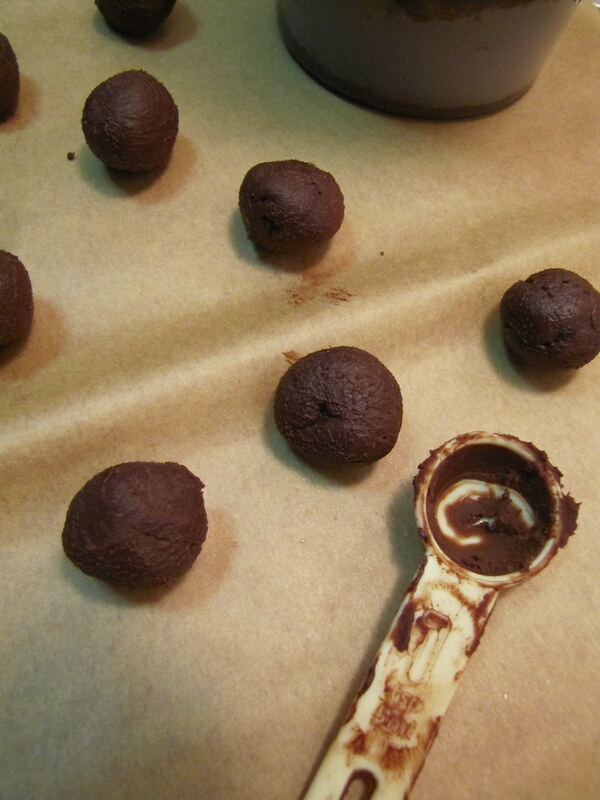 Making truffles instead of, say, cookies or a nutty loaf cake was a bit of a leap of faith for me. These chocolatey candies can be intimidating; they look professional, not something one usually thinks of as home-cooked. Truffles are named after the uber-expensive wild black mushroom (because they look like them, all dusty with cocoa and compact), adding to their unapproachable allure, perhaps. I’m no pastry-making expert and I can say in good conscience now that they are not so finicky to make as might seem. As long as you don’t mind them having a slightly “rustic” misshapen look. 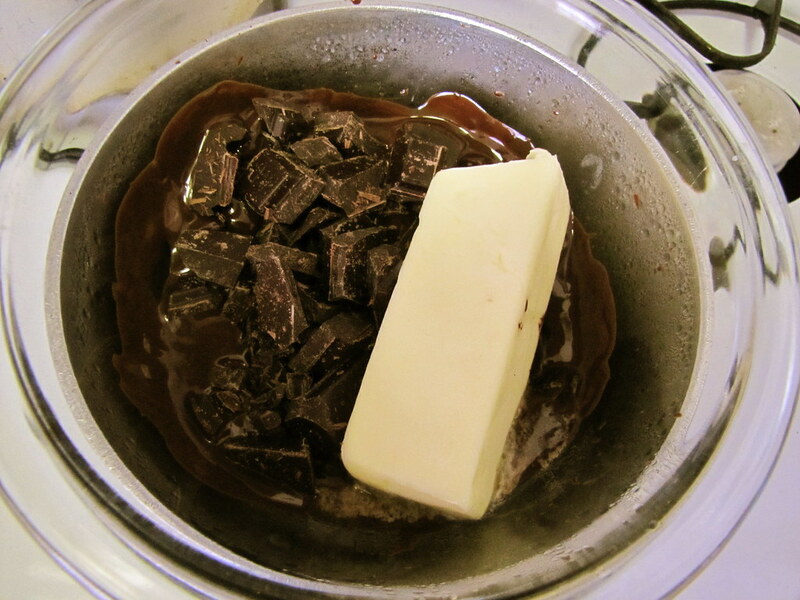 We start with the basics: some good baking chocolate (I used 72% Green & Black’s Organic), and butter. It gets melted over indirect heat (read: placed in a bowl set over a boiling pot of water), and the only tricky part is next whisking in a single egg yolk (for a batch of about thirty truffles). No sugar. Next, we chill the stuff until it’s solid, and bring it out of the fridge to let it soften for twenty minutes. I spent a while searching the cupboards for a satchel of matcha I thought I had. Matcha is a concentrated Japanese green tea powder often used in confectionery. Instead of the traditional black cocoa-coated truffles, I wanted mine to be green apple green, and taste like that wonderful powdered tea stuff, too. It was not to be found, for some hideous reason. But in the process of searching, I found a canister of roasted white sesame seeds. Sesame seeds would stick to the outside of the truffle just as well, I figured, and would still give it that surface coat that allows for easy handling. There are a lot of sesame seed-coated Asian desserts, actually, like those filled sticky rice balls of dim sum specialty. I’ve actually had some spicy fresh ginger-laced truffles in my time, and so know how well the flavor goes with chocolate. So there was still a chance for some Asian fusion here, after all. The basic truffle recipe I followed was from a lovely book called Chocolate Holidays, and it was as refreshingly simple as all that mentioned above. I just added some freshly grated ginger to the chocolate mixture while it was melting; it needed to be strained before chilling according to the recipe after all. So there’s no gingery bits in these smooth-as-silk balls. Just a lot of kick, and toasty sesame seed crunch. Funny enough, when DJ Never Forget bit into my truffle today on the air for Snacky Tunes, he made a comment about not liking truffles coated in cocoa powder. For that dry mouthfeel they immediately give, and the lack of much flavor, he said. The sesame seed switch seemed to go over well with everyone else, too. (They pop in the most delicate way when you bite down on them with your teeth, and yes, like to stick in between them, too.) Then again, who can complain about anything in a lil’ surprise present of food? 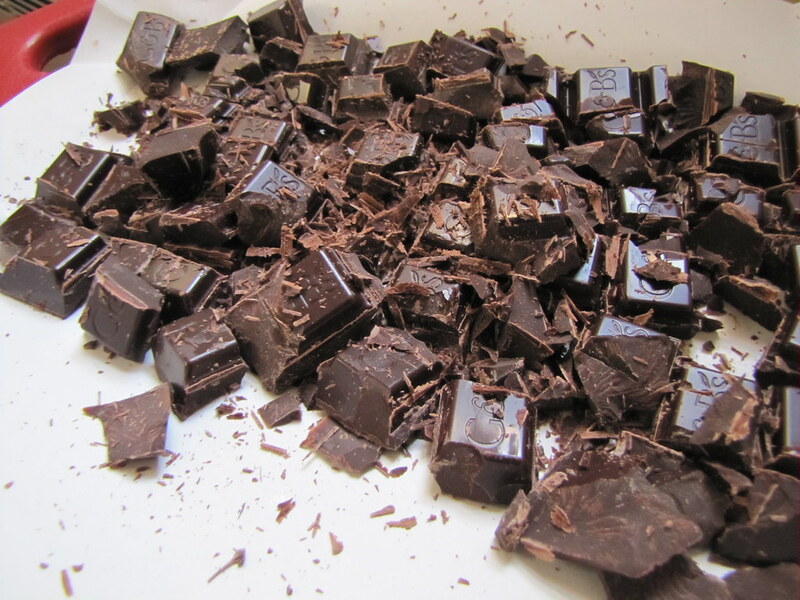 Chop chocolate into small pieces and place in a wide bowl with the butter, ginger and salt. Place the bowl over a saucepan filled with some water snugly. Bring the water to a steady, medium bowl and let the steam’s heat melt the chocolate and the butter, stirring occasionally. 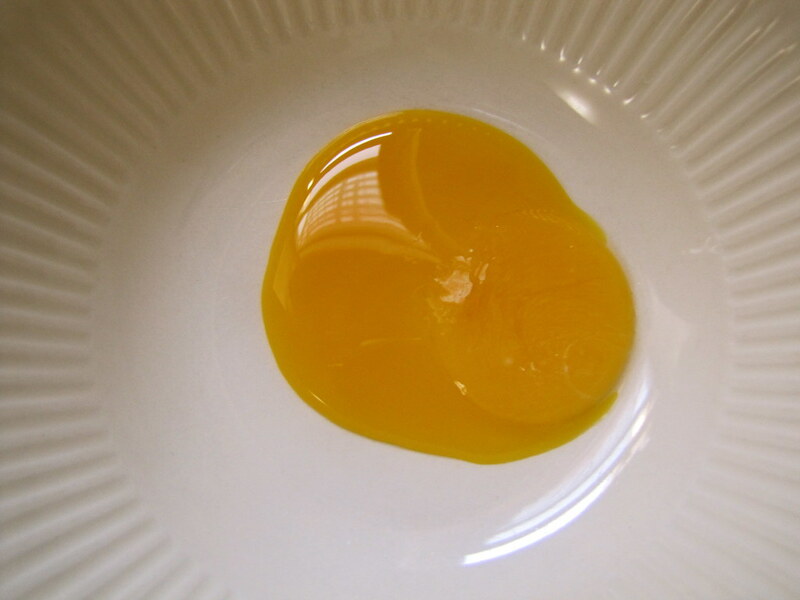 Meanwhile, whisk the egg yolk in a small bowl. Slowly add the 1/4 cup boiling water while whisking and continue to whisk another minute until fluffy and foamy. Place this bowl over another saucepan with boiling water and continue whisking 2-3 minutes or until the yolk is just slightly thickened and lighter in color. Fold the yolk mixture into the chocolate mixture with a spatula (not whisking). Strain chocolate mixture through a fine-mesh strainer into an airtight container. Cover and chill for at least 2 hours. Remove from refrigerator and let soften for about 20 minutes. Pour sesame seeds into a bowl. Scoop a melon baller-sized ball of the chocolate mixture at a time, and quickly roll the ball in your palms to a satisfyingly spheric shape. Toss immediately into the bowl of sesame seeds and roll a couple times to coat evenly. Place the truffle onto a sheet of waxed paper or into individual wrappers (I used mini cupcake liners). Chill at least 30 minutes before serving. Eight brownie points: As you can see, this recipe is extremely healthy on your wallet: for barely more than the price of the bar of chocolate, you get thirty gourmet-looking chocolats with inventive flavor, not so bad for the present-buying budget. However, it’s not healthy in the general sense. The truffle’s deliciously creamy texture comes from milkfat, hence it’s almost half butter. That point aside, however, it’s not as sweet a treat as far as candies go, and the higher the cacao percent (72%) in your chocolate, the less sugar and fat, and the more cocoa, which is a natural antioxidant. 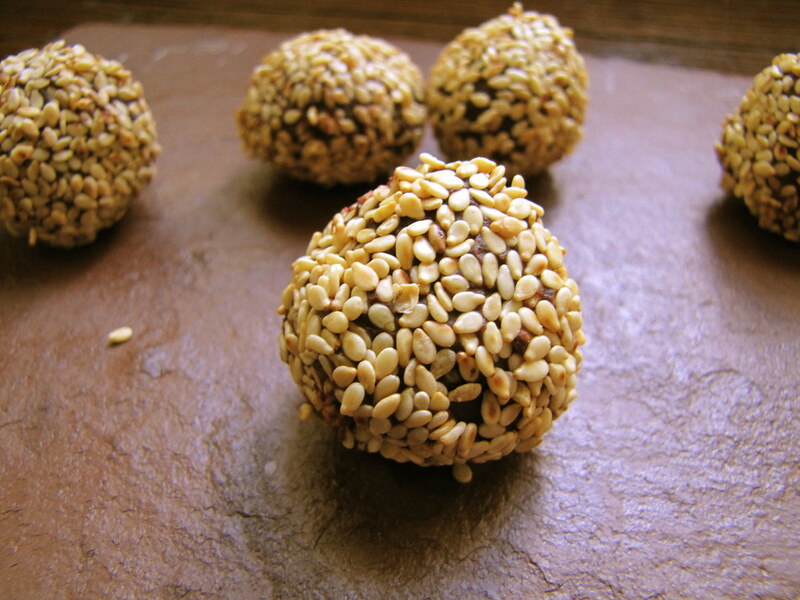 Sesame and ginger are totally natural accoutrements that lend minute doses of nutrition along with flavor and texture. Finally, you have to thank the inventor of the truffle for giving them such a dainty size. They’re so rich to boot that you won’t really feel the need to eat more than one. 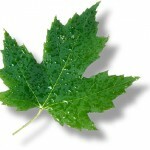 Five maple leaves: This is Green & Black’s organic chocolate, and Ronnybrook organic and local butter, mostly. And there are so many other choices of chocolate and butter you can find nowadays that are locally and responsibly made, so pick your favorite. 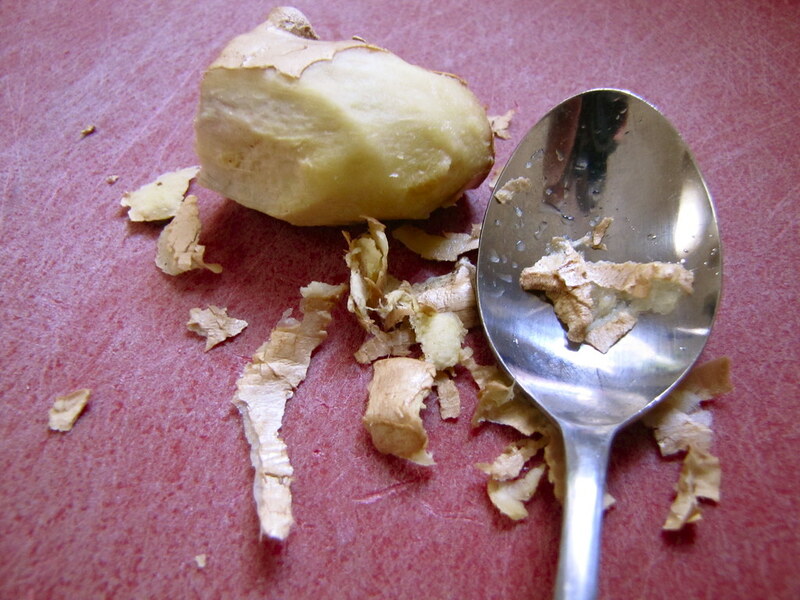 Unfortunately, ginger is not native to these parts, and the day when I’ve come across information tracing how earth-friendly or chemical-free the root is grown has not happened yet. 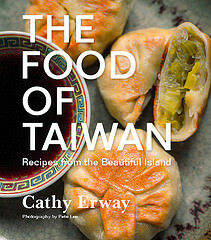 Sesame seed can reads: Product of Taiwan. Two strikes, but we’re only talking the minimal ingredients, at least. These look awesome. I’ve just moved to Miami from NYC and I miss having all the local folks so easily accessible with such diverse goodies. Julia: Whoa! Nice catch. I must be having brainfreeze. After nearly tearing apart the round Ronnybrook carton trying to get the butter out, I resorted to the last stick of Cabot or something in the fridge. And then totally forgot. No, they don’t make ’em in sticks yet, unfortunately! yay for truffles! they are also my pastry cop out for the holiday times. never tried the sesame seeds though but i will soon enough, they look delish! Those look amazing…kinda want to lick my computer screen a little bit.